Costa Del Sol Golf Club is an 18 hole course in Doral, Florida, with a driving range and practice green tucked inside the oldest residential community in Doral. The course was one of the first designs by ASGCA Architect Robert E. Cupp, who later went on to join Jack Nicklaus Design as a senior course designer. The course opened in 1974 and features 6,011 yards of golf from the longest tees for a par of 72. 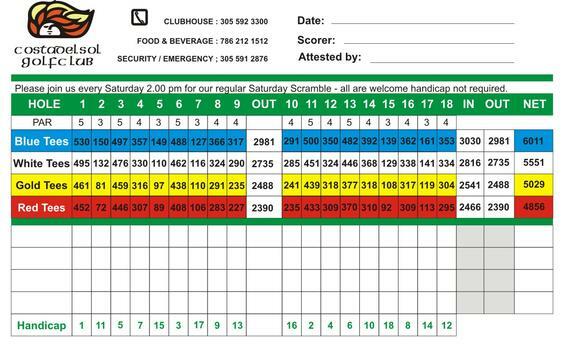 The course rating is 70.1 and it has a slope rating of 124. The intimate course is open to the public at affordable prices and boasts challenging fairways and numerous water hazards to test players of all skill levels. Visit Costa Del Sol Golf Club in Miami for golf lessons or come and work on your swing at the best driving range in Miami and take aim at our targets! We have a full service pro shop with a complete selection of golf merchandise. Clubs are available to rent in the pro shop, courtesy of Cesar’s Golf Rentals. The driving range is open daily from 7:00AM to 6:00PM. Please note the exception of every Thursday when the driving range will be closed until 8:30AM for maintenance. Please use the community entrance on NW 102nd Avenue & NW 41st Street to access the golf club. Play is governed by USGA rules of golf, except where local rules apply. All golfers are responsible for injury or damage to property resulting from errant golf balls. Lateral hazards designated by red stakes. Water hazards designated by the edge of water (no stakes). Ground under repair designated by blue stakes. Out of Bounds – designated by white and boundary fences. All yardage’s from landmarks are measured from center of green. Stones in bunkers which maybe a danger to a player, can be removed without penalty. Embedded ball: lift and clean only on fairway and green fringe. be alert to slow play, all groups are expected to keep up with pace of play (4 hours and 15 minutes a round). Players must be properly dressed. Appropriate golf attire is required. Each player must have his own bag and clubs. Observe all cart directional signs and cart ruls as directed by golf staff. Rake traps before leaving. Place rake in trap.